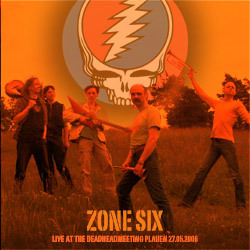 In May 2006, Zone Six, the all improv German act, performed for the German Grateful Dead fans in Plauen. The band played a more than 3 hour concert and provided on this CD-R is about 1/3 of that concert. The CD begins with Grateful Life, a really cool funky jam. Next is Rockhead to Eden and the band are really spacing out and Martin plays some cool synthesizer stuff before the drums kick in and the band flies. The next two pieces, the first, features female vocalist Michaela doing some chanting. Walt provides a lot of djembe drumming on the next two tracks which are really spaced out stuff with a lot of delay guitars and sound effects from the Dave. Desert train features James Dalton on harp, which is an interesting contrast to these spacey backgrounds that start the track off. The track goes on in many different directions up and down and with the addition of another guitarist on steel guitar it is spaced as it battles to be a blues song against all odds. The 18 minute Mindshaker ends the CD. This track also features the harp and is a slow track with some wild wah guitar. The track pretty much cruises until the last 6 minutes or so when the band is really freaking out with some very psychedelic stuff… Must have been a blast to be there. Enjoy the trip. Limited to 100 copies I believe.